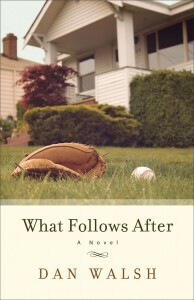 I enjoy Colleen Coble’s books and have read most of them. This book was no different. 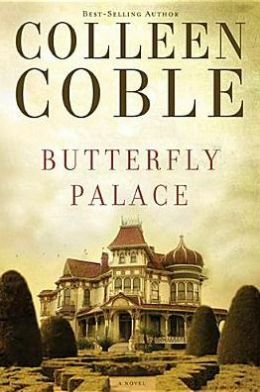 She beautifully weaves mystery, suspense, romance together in a historical setting in The Butterfly Palace. Throughout the book I was trying to figure out who was all involved in the “crime” and how they all fit together. In well written books, I can never quite figure out who is all involved and this was one of them. I had my suspicions, of course, but I couldn’t quite figure it out until it was revealed. If I had something negative to say about this book it would be in regards to the romance. I felt like it lacked something. The struggle was kind of just resolved and I didn’t feel like I really got to see how. Do you ever feel like you need to leave your past completely behind but you feel stuck in the place you’re in? Do you ever feel like you need a change of scenery? And because of circumstances you’re stuck where you are? That’s where I’m at right now. Actually it’s where I’ve been for the past several months if not longer. But because of fear and financial reasons I cannot leave yet. I guess I should tell you why I have the need to leave the community I have lived in my whole life. To start, I have to go back to the past. I didn’t have a horrible childhood but if anyone has read some of my more personal blog posts, they’ll know that it has affected me greatly. You can read some of those posts if you want to know more than I’ll say here. Looking back on my high school years, the only real positives I can take out of those four years are the awards I won for my grades and my short-lived acting career. Through most of high school I felt like I never fit in. I got along well with most people but I felt like I was always on the outside looking in and people just wanted to get homework answers from me. I attended my church’s youth group and outside of school, it was my social life. I would usually enjoy it but by the end of the events I would be depressed. I can’t remember a time where I would leave youth group and not be depressed. I would try to leave before I would get depressed but I was never able to. I always felt forgotten by the end of every event. I didn’t fit in and no one noticed when I left. The memories of those dark feelings have followed me through the years and makes me not attend my church’s college and career group with a lot of the same people. I’m also not the same person I was then and am sometimes afraid of reverting. At first when I “graduated” from youth group to the college and career group, I attended every event until I couldn’t make a few events in a row because I was busy those days. I stopped going for a while after that. Over the past three years I have maybe attended a handful of times. I used to make excuses to myself for why I couldn’t go but several months ago, I questioned why I felt like I had to make excuses to myself and discovered the true reason for why I never attended. It was because of what I said at the beginning of this section. Also, the handful of times I’ve gone, I’ve felt like I didn’t belong and went home feeling melancholy. The only reason I didn’t go home depressed was because I’d gained some coping skills but I was heading that direction after all those events. I also have issues with my church and my pastor that make me feel like I need to leave my community which I don’t relate to anymore but that’s for another post because otherwise this post will get too long. I need to leave my hometown. But right now because of my financial situation, I can’t yet. I’m also going to school but I’m thinking of getting a job elsewhere so I have to move away after I’m done my program. I feel like in order for me to grow both spiritually and emotionally I need to leave the community I’ve grown up in. Unfortunately because of circumstances I’m stuck here for at least one more year. But after that, I hope to be gone and maybe never return. P.S. Here is a video I created telling the story of my journey with my self-esteem if anyone wants to watch it. She went to Kenya to climb a mountain. But God had other plans. When Claire Díaz-Ortiz arrived in Kenya at the end of an around-the-world journey, she decided to stay the night, climb Mount Kenya, and then head back home. She entered an orphanage, seeing it as little more than a free place to spend the night before her mountain trek. Sammy Ikua Gachagua had lost his father to illness, his mother to abandonment, and his home to poverty. By age ten, he was living in a shack with several other children and very little food. He entered an orphanage, seeing it as a miracle with three meals a day, a bed to sleep in, and clothes on his back. 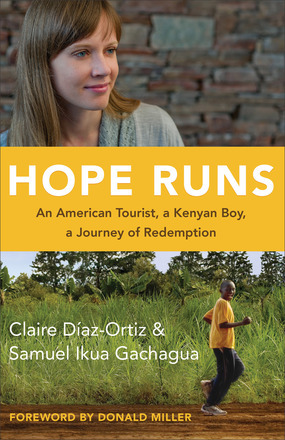 Hope Runs is the emotional story of one American tourist, one Kenyan orphan, and how one day became one year that would change the course of both of their lives forever. It’s about opening your heart to outrageous possibilities. It’s about what it means to hope for the things you cannot see. It’s about how God can change your life in the blink of an eye. I liked that the story was told from two different perspectives. It added depth to the story and they were written in a different way so it wasn’t confusing figuring out who was speaking. I enjoyed hearing Sammy’s story of what brought him to the orphanage but also of his experiences in the orphanage. I didn’t relate as well to Claire’s story nor enjoy it as much as Sammy’s. This book made me think about short term missions trips and how they don’t really help those they are meant to. There were plenty of people who were in Sammy’s life one day and out the next. It made me think of how short term missions trips are more for the person going than for anyone else. In 1962, life was simple, the world made sense, and all families were happy. And when they weren’t, everyone knew you were supposed to pretend. With their family about to collapse, Colt Harrison and his little brother, Timmy, hatched a plan. They would run away from their Florida home, head for their aunt’s house in Savannah, Georgia, and refuse to come home until their parents got back together. But things go terribly, terribly wrong. Colt’s mother and father must come to grips with years of neglect and mistrust in order to recover their sons, their love for one another, and their broken marriage. In this emotional story set against the backdrop of the Cuban Missile Crisis, Dan Walsh takes readers on a journey to rediscover the things that matter most in life–love, truth, and family. This book was written in a different style than I am used to and it took me a little while to fully get into it. At the beginning I thought it was going to flip back and forth between the present and the past and I was hoping it wouldn’t and thankfully it didn’t. I kind of liked how it started off as first person and ended as first person but everything in between when it was in the past it was in third person. I thought there was more telling than showing because there wasn’t much description on facial expressions and I found there were a few point of view errors. The description wasn’t as much as I was used to but I think it just made for a faster read. There were times I would forget the majority of the book was set in the 1960s especially when it came to phoning people because I would catch myself thinking couldn’t they just use a cell phone. So I would occasionally have to remind myself it was taking place over 50 years ago. I liked the story of a family trying to find their little boy and working through their marriage issues which started everything. Here is a recipe for Eleanor Braddock’s savory custard. Eleanor Braddock is a character in Tamera Alexander’s new novel A Beauty So Rare who loves to cook. Here is the recipe and what Tamera has to say about it and her novel. Most people think quiche originated in France. Not so. It’s originally a German dish and people referred to them as “savory custards” in the 19th century. Which is accurate since the egg-based mixture forms a luscious-like custard as it bakes. In my novel, A Beauty So Rare, the second standalone novel in the Belmont Mansion series, the heroine, Eleanor Braddock, is “a cook with a dream.” But her dreams don’t quite turn out like she thinks they will. However, her savories always do! I hope you enjoy this recipe (or “receipt” as recipes were called in the 1800s) from A Beauty So Rare. For more about A Beauty So Rare and for recipes from all my novels, visit www.TameraAlexander.com. This pie crust “freezes beautifully ” as they say in Steel Magnolias (instructions on freezing below), so even though I may need only one pie crust at the moment, I always use this recipe and make a second, and freeze it for later. Makes that next pie (or savory custard) go twice as fast! Using a spatula, carefully lift the dough from the surface of the counter into the pie pan. (I sometimes fold my well-floured dough in half and then “unfold” it onto iron skillet. Or you can lop it over your rolling pin. That works well, too.) Gently press the dough against the sides of the pan or skillet, getting it all tucked in. Then crimp the edges in whatever way you prefer. And now, you’re ready for that yummy savory custard filling above, or maybe for a fruit pie. Antoinette Tuff’s courage and faith prevented tragedy in a school under siege. 870 children waited in fear as their elementary school rushed into lockdown mode. As the nation faced yet another Sandy Hook story of tragedy, one woman rewrote the ending. Yet the story doesn’t start with those first steps Michael Hill took into that Atlanta elementary school. It starts with Antoinette Tuff, a woman who faced her own pain, hurt, and rejection, yet held onto grace, faith, and hope. A hope that anchored her in the most high-stakes moments, a grace that allowed her to empathize with a hurting young man, and a faith that gave her the courage to love him back from the brink. This is more than just the amazing account of tragedy averted. It’s the evidence of what we can do when we allow ourselves to be used by God. And it’s a story of how God uses all of our life experiences, the good and the bad, to prepare us for our own moment of divine purpose. This book is a fast read and I found it interesting to read about Antoinette Tuff’s experience of stopping a school shooting. I’ve heard about ones that have happened and it was interesting reading someone’s first person account of what happened in one that could have ended up like most of the other shootings. I did find the book jumped all over the place. Once Tuff started talking about the events of the shooting, I just wanted to know what happened but instead Tuff would jump to her personal experiences which were interesting but I just wanted to know what happened in the shooting. This is an interesting book for what it contains, although not everyone will agree with the theology she includes as I didn’t always agree with it.